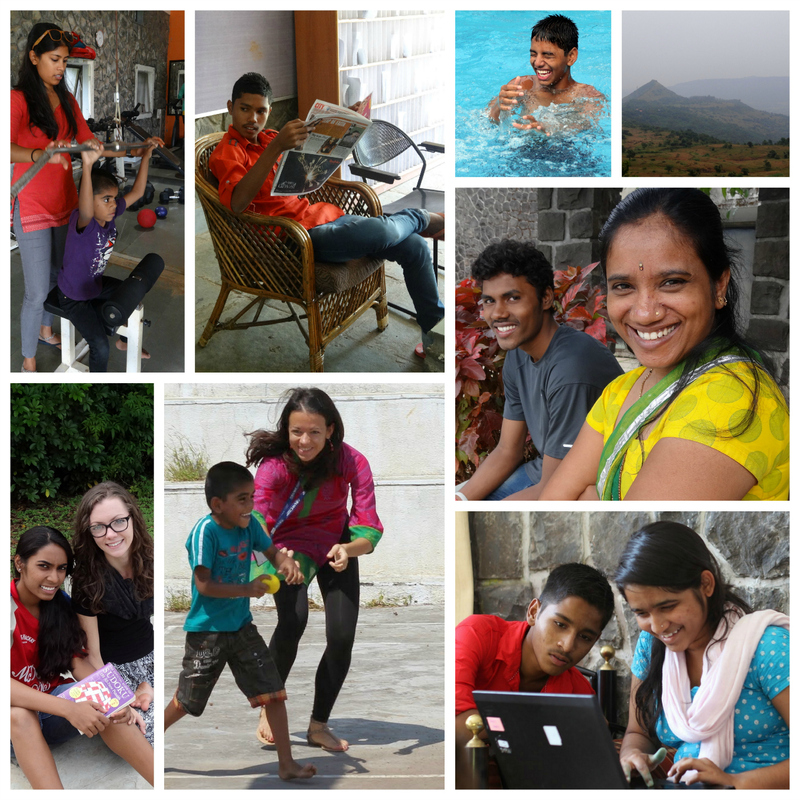 As usual, the Residential Program kids had a couple weeks off for Diwali to enjoy the festivities and take a well-deserved break from daily rigors of school. This year, we kicked off Diwali break with a four-day trip to the Mahindra United World College of India (MUWCI), an International Baccalaureate junior college where one of our our oldest girls, Jyoti, recently began the 2-year IB program. The children were delighted to be back on MUWCI’s picturesque mountainside campus for the second year in a row, excited to be reunited with Jyoti and away from the booming firecrackers and bustling crowds that fill Pune’s city center during the Diwali season. The first night, caregiver Sangeeta, former Residential Director, Sam, volunteer Amelia, and the kids got to spend some time with Jyoti, getting the inside scoop on her life as MUWCI student and hanging out in her new room. Afterwards, the older teenagers were given the opportunity to bunk with the MUWCI students in the wadas (residential units) for the full campus experience. Introductions were made and they settled right in for a few days of swimming, trekking, and Diwali fun. Some of them even got to sit in on classes. Ultimately, this was a really cool experience that enabled our oldest children to make friends, try new things, and envision what life would be like as MUWCI student. Definitely a perk of being one of the big kids! The morning of Lakshmi Puja, MK didi, board member, Judith, and a few friends from Austria joined them for the celebration. The festivities began early with games of kho kho and kabbadi on MUWCI’s football field. For those not familiar, both traditional Indian games require running, tagging, and—in some cases—tackling, so the group was thoroughly grass-stained and happy to take a break by the time lunch rolled around. The rest of the day was spent painting diyas (earthen oil lamps), making rangoli designs, and building miniature earthen forts (an exclusively Maharashtrian Diwali tradition). 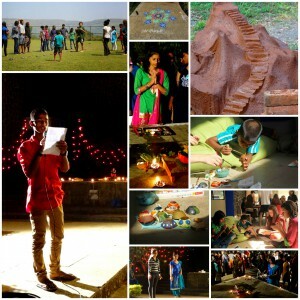 As much fun as the daytime activities were, everyone agreed that the Lakshmi Puja and subsequent Diwali party under the dreamily twinkling lights on the lawn was the most enchanting part of the celebration. Before Sangeeta performed the puja, Tushar gave a brief speech about the significance and history of Diwali that made the AIC family tremendously proud and grateful for the opportunity to share a piece of Indian culture with the staff and students at MUWCI. There was plenty of laughing, singing, and sugar cane juice to go around. Jyoti and Sonali busted out their dance skills and stole the show during the performance portion of the program. There was even a Bollywood dance party to cap off the night. Everyone left the party in such high spirits, happy to have another full day to spend adventuring together. The final days of the trip were full of pool side antics, mountain treks, movies, and hang out time with the MUWCI students. When it was all said and done, no one could think of a more a fantastic way to start Diwali vacation. Big thanks to everyone at MUWCI who made the AIC family feel so welcome. An especially big thanks to Ingrid whose enthusiasm and warmth helped make this trip truly special, and who opened her home to Sanjay and Tushar. We know that Jyoti is in excellent hands with all of you.